Providing Toledo with wholesome, fresh, natural food. A cooperative is a business owned and operated by its members. It is democratically run and is governed by a board of directors elected by the membership. Among the most important functions of the Board is to appoint and evaluate a general manager. 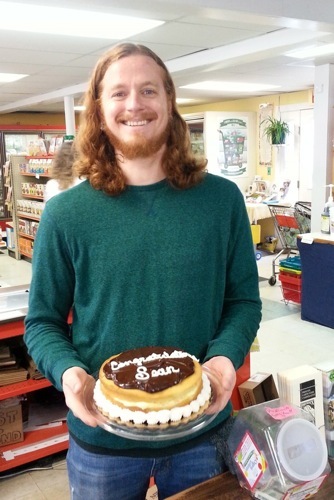 At its 4/22/2015 meeting, the Board decided to appoint Sean Fitzgerald as the Co-op's new general manager. The pictures on the right show Sean with celebratory cake and with members of the Board. 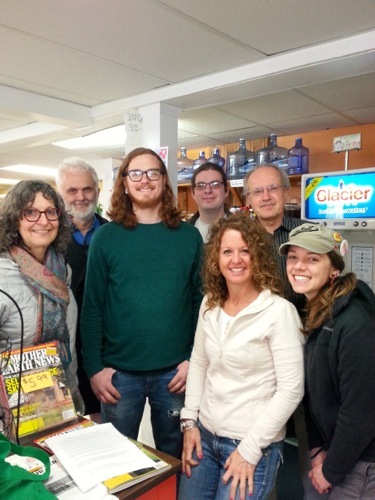 The Phoenix Earth Food Co-op is committed to promoting, through its sales and educational outreach, a philosophy of life that is nutritionally and environmentally sound. Our Board President, Sean Nestor, and General Manager, Lisa Blake, are on the steering committee of Label-the-Truth Ohio. The mission of Label-the-Truth is to put a constitutional amendment on the 2014 ballot that mandates the labeling of GMOs. We're forwarding this announcement for those of you who are interested in getting informed and getting involved. The Co-op does not involve itself in partisan politics, but it DOES promote health and well-being of the individual and community through education about food issues, and, of course, always offering the best food at the best prices. GMO labelling in California: The Corncucopia Institute s webpage with infographic in support of Californian Proposition 37, requiring labelling GMOs. Winning An Ongoing Battle, a short portrait of the Co-op written by Lisa Blake in tasteforlife magazine (reproduced with permission). GMO and us—a message from our GM. A recent study reveals the many benefits of cooperative groceries for the local economy, a healthy environment, and your own health.